WORDS ARE POWERFUL. THE WORDS OF JESUS, ESPECIALLY SO. The Crucified Life Devotional provides a daily space in which we can meditate on Jesus' final words from the cross. As we consider His words, we understand and identify with His suffering in a way that challenges us, transforms us, and ultimately brings us hope. 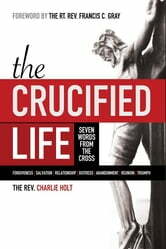 Whether used as part of The Crucified Life small group study series or individually, this Daily Devotional will help you hear Jesus' words from the cross in a personal and life changing way. This devotional can best be used in conjunction with the unique small group curriculum the Christian Life Trilogy. This first series in the trilogy, The Crucified Life, centers on a DVD teaching exploring the Seven Last Words spoken by Christ on the cross. There are seven teaching sessions, one for each word spoken by Christ. As you walk through the curriculum with a small group or Sunday School class, you will have the opportunity to hear in-depth Biblical teaching and openly discuss the teaching in your group. Together, you'll observe a holy Lent as you study and delve deeply into God's Word. You'll also strengthen the bonds of community as you grow together, allowing your lives to be transformed by what you discover. To order small group resources search online for Christian Life Trilogy! Marque éditoriale : Bible Study Media, Inc.